What is the best barrel break in procedure? There are several proper ways of breaking in a barrel. You could argue until you are blue in the face about the best way to do it, but you will never win that argument. We have composed a few ideas in what has worked for us over the past 22 years. Being a benchrest shooter I have seen barrel break-in performed several different ways, but the most popular is by polishing the bore first. Almost all high end barrel makers polish the bore from the factory and this step should be skipped if you're lucky enough to be purchasing one of these high quality barrels. If you are thinking about breaking in a chrome lined barrel - don't bother. There is no reason to break-in or polish a chrome lined barrel, the finish is very durable and any imperfections are now part of the hard chrome surface. 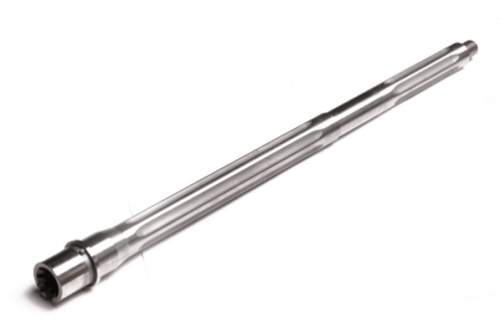 Polish the bore: This requires care and attention to details: First step is to round up a good stainless steel cleaning rod, a jar of JB bore cleaner, some proper fitting patches and nylon brush, and a high quality bore guide. Properly insert the bore guide and verify the fit then tightly wrap a patch around the nylon brush and place a fair amount of JB bore cleaner on the patch. Insert into the chamber guide and start pushing the rod through the bore. It is important to not let the brush and patches exit the end of the barrel, you want to keep the crown as pristine as possible and to be able to pull the brush back with the least amount of hassle. Perform 20 strokes, replace the patch and add more JB and keep going until you get to 80 or more passes. Once finished clean the barrel and remove the residual JB bore cleaner. I like to use Kroil for this step and for all finish passes when I clean a barrel.The idea here is to remove tool machining marks from the rifling process and provide a uniformly clean - polished surface to the bore. Break in cleaning: Once the bore is polished or purchased as such, the break-in routine continues at the range (this is also a great time to start dialing in your scope). You will need the bore guide, cleaning rod, high quality copper solvent/bore cleaner, and a proper fitting jag with patches. The idea behind this break in is to flatten any remaing roughness and tooling marks onto a clean surface, not powder residue or copper. Shoot 1 round, clean the barrel with copper solvent until the patches come clean, and repeat 3 times. Now shoot 5 rounds - repeat twice, by now you should have shot a total of 13 rounds, the scope should be dialed in and you ready for some real shooting. Dislcaimer: This is the procedure I have learned from some top benchrest shooters, it may not be the best or the worst but works good for my application. I spoken with some of the best rifle makers in the U.S. about barrel break in and there is some consensus that it is not needed on high end rifles. Always follow the manufactures direction for break-in for warranty reasons.